This is a picture of the wonderful slant board my friend, Kristen Burdette, and her husband, Mark, designed to fill my need for a sturdy slanted reading and writing surface for students. I have tested several versions of their boards at ILC as they have worked to develop the design. I LOVE this slant board! It has a removable ledge to hold books, flashcards or letter tiles as well as a clip at the top for holding paper, notes or visual aids. The ledge is easily taken off to use the board for writing purposes. The clip also holds a removable dry erase board which comes with the board. The durable construction as well as the rubber feet keep the board stable even for my most wiggly students (unlike my first slant board which I purchased from a company on-line). I use 2 of these slant boards regularly when teaching, one for my student and one for me (my neck always thanks me). Vision – The use of a slant board when reading may reduce eye strain. Because the text is at a consistent angle, the child does not need to continually refocus. Increased Oxygen to the Brain – A slouched body position leads to decreased circulation and inefficient breathing. Decreased Neck Strain, Decreased Vertebral Compression – Writing or reading on a flat surface promotes an unbalanced posture (see picture 1) this can cause increased torque, force and compression of the intervertebral disks of the spine. 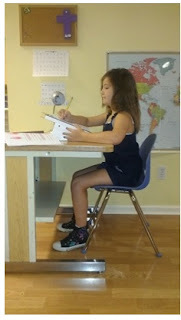 Writing – The angle of the slant board promotes better shoulder, arm and hand position for writing and drawing. The paper is closer, making it easier to see and reach, the wrist is in flexion using the right amount of muscle force to hold a pencil. Improved attention - The board defines a work space for the student bringing the work which needs attention closer and helping the student distinguish it from distraction which might be around it. As a result of the interest these boards have generated, the Burdettes are offering them to the public for $60. Each board includes the removable ledge, clip & dry erase board. This is a REALLY good price for a sturdy board like this. And as a bonus you get to support a new small local business venture which is part of the Integrated Learning Connections small business network (not an "official" organization, just term for my personal network of friends providing services to children through home-based businesses). “Posture relates not only to spatial judgments, but also to performing visual tasks” Dr. Darrell Boyd Harmon, creator of the Harmon Distance. 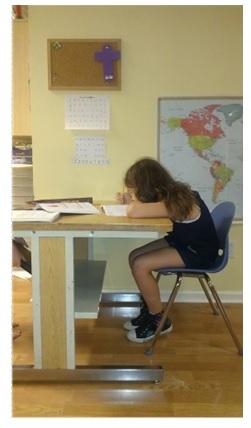 “We perpetuate a culture of discomfort and bad ergonomics for our young students, even though it has been proven that the right chair, the right posture, and the right fit can greatly improve performance across the board.” Eric Steinman, author of Pain in the Class: The Ergonomics of the Classroom Desk. Information on this blog is for educational purposes only. Please make healthcare decisions based on your own research and in conjunction with the advice of qualified healthcare practitioners.